*We are Sold Out in advance RSVP’s on Brown Paper Tickets - please contact angie [at] nightwoodtheatre [dot] net if you would like to be placed on the waiting list, or if you are no longer able to attend. Marion - a busy, working mother - has discovered a devastating secret. She arrives at a parent-teacher interview to accuse the woman who may be the thread that unravels her entire life - her son’s teacher, Teresa. What ensues is a gripping and raw confrontation between two women: one who’s fighting to protect her family, the other who is fighting for the family she has always wanted. In a new sequel set eight years later, Teresa tries to reconnect with Marion after a heartbreaking tragedy. But is she there for forgiveness, revenge, or something entirely different? A play about love, grief, betrayal, marriage and aging, Between The Sheets questions the definitions of right versus wrong and the lengths we go to get what we want. 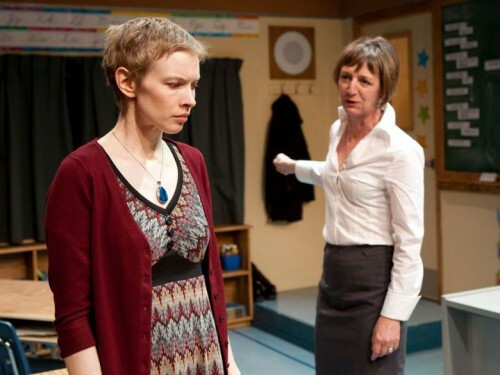 Between The Sheets was first produced by Nightwood Theatre in 2012 - starring Susan Coyne and Christine Horne, directed by Kelly Thornton. Since its world premiere, the play has been produced across Canada as well as in New Zealand, Slovenia, Iran and the U.K. The play has been published by Playwrights Canada Press and translated into several languages internationally. Jordi Mand is a Toronto-based writer who has worked with some of Canada’s most prominent theatre companies. Her plays include: Between the Sheets (Nightwood Theatre), Caught (Theatre Passe Muraille), This Will Be Excellent (Carousel Players) and Brontë: The World Without (Stratford Festival). Her work has been produced nationally, internationally and published by Playwrights Canada Press. Jordi was a Resident in the 2017 Bell Media Prime TV Program at the Canadian Film Centre and has been a Playwright-in-Residence with Theatre Passe Muraille, Carousel Players and Nightswimming Theatre. She is a past member of the Tarragon Theatre’s Playwrights Unit and the Stratford Festival’s Playwrights Retreat. Upcoming: writer on Season 4 of the hit CTV Canadian crime drama TV series Cardinal, and writer of the film adaptation of Harriet Alida Lye’s thriller novel, The Honey Farm. Support provided in memory of Margaret Hirsch Zielony.